24 cm ix, 239 p.
Routledge Introductions to Applied Linguistics consists of introductory level textbooks covering the core topics in Applied Linguistics, designed for those entering postgraduate studies and language professionals returning to academic study. The books take an innovative "practice to theory" approach, with a `back to front' structure which takes the reader from real life problems and issues in the field, then enters into a discussion of intervention and how to engage with these concerns. The final section concludes by tying the practical issues to theoretical foundations. Additional features include tasks with commentaries, a glossary of key terms, and an annotated further reading section. This book looks particularly at the relationship between language, interaction and learning. 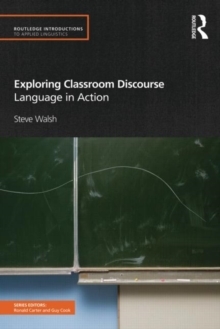 Providing a comprehensive account of current perspectives on classroom discourse, the book aims to promote a fuller understanding of interaction, regarded as being central to effective teaching and introduces the concept of classroom interactional competence (CIC). The case is made in this book for a need not only to describe classroom discourse, but to ensure that teachers and learners develop the kind of interactional competence which will result in more engaged, dynamic classrooms where learners are actively involved in the learning process. This approach makes an invaluable resource for language teachers, as well as students of language and education, and language acquisition within the field of applied linguistics.